We value your privacy and would never spam you. You will only receive updates about new releases and offers and can unsubscribe at any time. 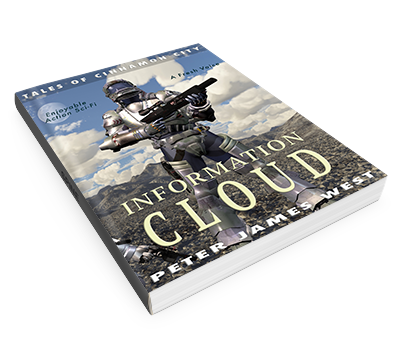 Information Cloud is the first book in the Science Fiction Series Tales of Cinnamon City. For a limited time it's now available FREE! The citizens of Cinnamon City are growing restless under the Dome Shield. The Security Forces are stretched to breaking point. Major Rachel Henson feels like something is changing inside her, but she doesn't want to face the truth. She struggles to keep a low profile as her strange new abilities grow stronger day by day. In the South, the Kamari are raising an army to challenge Central Command. The Battle of Havers Compound is about to begin. Lord Hades fears that technology will be the end of man, but he is powerless to stop the factions of the Orange Zone from destroying each other. The race is on to create ever more disturbing machines to win yet another war. An amazing page-turner which brings believable people and storyline to a fantastic science fiction universe. If you're a fan of sci-fi (or war novels) I would highly recommend this book. I eagerly look forward to the next one. West paints a thoroughly believable picture of a world interconnected through information. As security is breached, technology by-passed or stolen, the superficial tranquility of Cinnamon City is torn by momentous upheaval, massive robots, thundering machines of destruction, threats of annihilation and lots of regular old bloodshed. Cinematic in its scope, West crafts a world that allows a reader's visual imagination run riot, amongst massive explosions, thundering machinery, thousands of foot soldiers whilst introducing very human characters that are humorous, venal, avaricious and, above all, believable. Great characters and technology support a good plot. Well written and convincing this is a great start to what is undoubtedly a brilliant series. What great book! I do not normally enjoy post apocalyptic stories, but I really could not class this as one. It was more of a futuristic view of the future. Technology, food, security for The people and otherwise pretty normal lives for most citizens, except those of the security forces. The book started with a run, then slowed briefly to introduce important new characters and then blitzed away again. The characters were well developed and either like-able or extremely hateful, which made for an exciting read, rooting for your favourites. The book was well written and flowed seamlessly from one chapter to the next, making it impossible to put down at any point. The technology created in the book for the battles was mind boggling and frightening. The human is capable of terrible cruelties towards what they consider lesser beings. I am really looking forward to the next book. Really hope I don't have to wait too long. I really need to know what happens next!! !